Not many people know of the 'transfer'. What it is or even the fact that it happens. When one sees a while van outside a hospital they would assume it was a courier. However this is not always the case, it might just well be a transfer crew. At this point you might be asking what a transfer is. Simply put it is the process of moving a body from one place to another. When someone dies in a hospital, their home or somewhere else they need to get to the funeral home. This is what a transfer is. Generally funeral company employees such as undertakers will do the transfer. There are also transfer companies who do not do funerals or anything other than transferring bodies about. These companies generally deal with the more difficult transfers such as interstate or after hours. No qualifications or training is needed to do a transfer. The transfer crews are just regular people on minimum wage and have no equipment other than a pair of gloves. This is the same with police transfers, there is no government group who transfer bodies. In other words a couple of undertakers will move the body from the crime scene to the coroners. House transfer - the act of removing a body from a home or private residence to take to a funeral place. This is the most intimate and personal form of transfer, and has the most chance for the family to be present. It is also the most unpredictable transfer. Nursing home transfer - the act of removing a body from a nursing home to take to a funeral place. This is a fairly intimate and delicate transfer. There will be other residents, relatives and patients who know why the transfer crew are there and will not like it. The family, or other residents might be there watching. 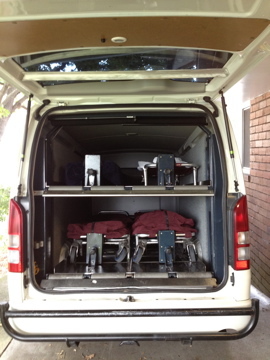 Hospital transfers - the act of removing a body from a hospital to take to a funeral place. This is not really an intimate form of transfer. It is in fact one of the easier, simpler and predictable. Relocation transfer - the act of collecting a body from the coroners to take to a funeral place or the act of collecting a body to take to the coroners, hospital or somewhere else. It can involve police jobs (such as murders, suicides, accidents, etc) and other random work. This is a highly unpredictable form of transfer. A transfer vehicle is just a while van. Some places use a station-wagon at nursing homes or houses to be more "discreet". Yet in almost all cases a Toyota Hiace is used to transfer the dead. A few funeral companies such as InvoCare use white Mercedes vans, but the vast majority use a Toyota Hiace. The transfer can can hold four bodies at a single time thanks to a shelf in the middle. This shelf uses a hydraulic system so it can be raised and lowered to make getting bodies in and out easier. Not just any car can be used to transfer a body. I do not know the specifics but in NSW a transfer vehicle must have a a airtight compartment for the body, sealed and separated from the driver. This compartment must also vent to the outside of the car. However not all transfer vehicles meet either of these requirements. But either way one cannot just collect a body from a hospital in a regular car. Although some have tried. 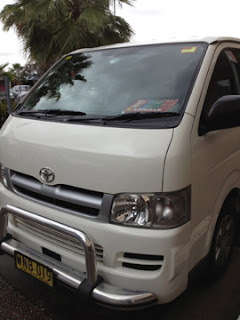 For more information and photos of a transfer van go to this post. Two stretchers on top of each other. The 'carry' stretcher is on top of the ambulance stretcher. There are two main types of stretchers. The cheaper and simpler type is the "two man" or "carry" stretcher. This stretcher has two wheels at the foot end and no wheels at the head end. The other thing is that the wheels on this stretcher are fixed and cannot be raised or lowered. Which means the stretcher has to be carried about. This means the carry stretcher is quite light and piratical in areas where a lot of carrying is needed. The other type of stretcher is the "ambulance" or "collapsable" stretcher. This stretcher has four wheels on the end of legs. So the legs, and the whole stretcher, can be raised and lowered. A benefit is that the stretcher can be raised to bed hight and that the stretcher does not need to be carried. The down side is that this stretcher is quite expensive and heavy. The ambulance stretcher was my favourite, loading it up into the back of the transfer van had such a satisfying click and clank. A body always travels foot first when going anywhere. This means the zipper on the stretcher and body bag must be at the head end. It also means the body should go into a vehicle, be it a transfer van or hearse, foot first. So that as the car drives the body travels foot first. The other thing is that a body should be wheeled or carried on the stretcher foot first. This actually has a rather practical reason. Bodies are liable to 'purge' which is not nice. Purging is basically when a body 'leaks' fluids out of the mouth or nose. To prevent this one must always keep the head higher than the torso. So when carrying a body down stairs take it foot first. This is perhaps the most important aspect of the transfer. Making sure you have the correct body. It is obviously very important as collecting or identifying the wrong body could have serious consequences. So the correct name tage has to be on the correct body. The first thing you should do is check to make sure you have the right body. In a hospital look for ID tags on their wrists, all patients wear them. Nursing homes do not generally have a good ID system, so you will have to rely on the nurses. Generally the best you can do outside a hospital or the coroners is hope and go by what others say. Next you will need to place your own ID tag on the body. Contrary to popular belief the funeral industry does not use toe tags. I explain the reasons why we use wrist tags and why toe tags are never used in this post here. The appropriate paperwork is essential. You cannot and must not ever move a body without a DC (death certificate) or an interim. An interim is a temporary document to say the person is dead, it allows one to transfer a body and to start the paperwork for a funeral. However a DC will be needed for a burial or cremation and to actually go through with the funeral. - Is it the original? - Is it filled out correctly? - Does it have the name of the deceased (the exact and correct name)? - Does it have a date of death? - Has it been signed? There are more specifics, such as a DC must also list cause of death and duration for the cause. However these other specifics vary and are too numerous to list here. The other thing to not with paperwork is if the body is going to be cremated a CC (cremation certificate) will be needed. You will not need a CC to transfer or bury the body but it is a must for cremations. The price differs with each state, in NSW it is $88 but it is only $65 in QLD (as far as I am told). The other thing is a CC will cost $88 to get from the hospital which has to be paid for by check. So make sure if the body is due for a cremation that you wither have a check to get the CC or payment has been arranged. And do not forget to actually collect the CC!! With the DC and CC check to see if the body has a pacemaker. If there is a pacemaker or other "battery" device inside the body then it must be removed before cremation. They explore in the crematorium and can do serious damage. At the end of the day actively check all paperwork. There are little issues to look for, like question10 on a CC is often missed by doctors because it is in small writing and right where the paper is usually folded. So the fold hides the question, and it is an important question. All items need to be catalogued and recorded, to do so they are grouped under 'valuables'. Valuables are the items on or with the body other than clothing. Anything and everything on the body is considered a valuable. These items might not actually have any real 'value' but they are all treated as precious. I remember one valuable was just a piece of string, but it was important to the deceased and the family. So we treated it as though it carefully. Not everything is a valuable. Clothing, while recorded and catalogued, are not counted as valuables and have their own section. Things in the room with the decease are also not valuables unless told otherwise. Basically valuables are only what is on the body and going with the body. Always count and record valuables! But do not be too specific. For example with a diamond gold ring one would write "yellow coloured metal ring with white stone". It is unknown for sure if the ring is gold and the stone is a diamond, so just describe it visually and simplistically. Too much detail might be incorrect or confusing. I get asked this a lot. Many people assume that those who transfer bodies get paid a fortune. That it is a job so few want to do that it must pay well. Or they assume there is lots of training and equipment needed. Truth is that it is a minimum wage job with no safety equipment other than a pair of regular gloves. The only thing needed to transfer a body is a drivers license. - To learn about what becomes of medical waste and the cadaver go here. - To read about wrist tags and why toe tags are not used go here. - For pictures and a description of a transfer van go here. - For information and descriptions about body bags go here. - To read a funny and rather unusual story about a transfer go here. - For funeral industry terminology go here. for more read you can read this - "Luxury Funeral Transfers- A Great Way to Pay Homage"
Do you have a pricing sheet on tranfers you could share with me? This is my job and I don't get paid minimum wage. It's offensive that you imply any clown off the street that needs a minimum wage job can do this. Actually I am a transfer driver for a funeral home here in Calgary and I did not need any experience to do this job. All you really need is common sense and a good trainer. As long as you can lift, be respectful and have the stomach for it. A lot of people could do this job. Do you always work with a partner to help you? Office relocation services in Perth includes the work of Cheap Furniture removalists in Perth working in the safe office relocation in Perth smoothly, quickly and effectively. Mmm...in NC you are required to have a yearly permit from the NC Funeral Board. Back ground check. Nice information for different Office relocation Services provider. Nice information with good content. I hope, the people will get gain from this transfers. Keep up your good work. We buried my dad a Rookwood Cemetery (Sydney) 35 years ago. I would like to transfer his remains to the cemetery in Broken Hill NSW. After exhumation, considering that the only remains would be bones, would it be possible for me to transport his remains myself in a new coffin in the back of a ute?